Understanding the Holy Quran: Huroof Muqatta’at - Disjoined Letters ~ Islam My Ultimate Decision . The Holy Qur'an is a Divine book which was revealed unto Prophet Muhammad (peace be upon him) in a time period of some 23 years. The language of this Holy Scripture is Arabic. But its grammar is far richer than the ordinary Arabic grammar and an ordinary Arabic speaking cannot fathom the true meaning and explanation of the text. It is only those scholars who have spent their lives trying to understand the true meaning of the Divine message. 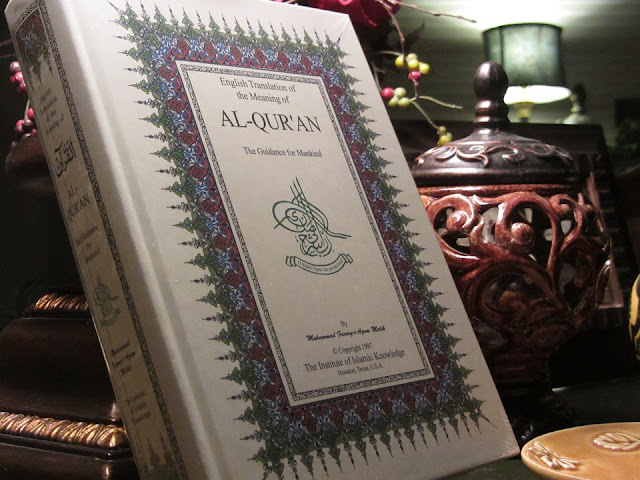 and it is not known whether man has been able to understand and interpret the Holy Qur'an fully even as of today. While ordinarily, the messages and the commandments contained therein have generally been understood and explained, there are a number of Surahs of the Holy Qur'an which commence with or contain some disjoined letters called Huroof Muqatta’at, or the abbreviated letters. A number of conjectures have been made as to their meaning. Opinions are divided as to the exact meaning of each particular letter or a combination of letters, and it is unanimously agreed by scholars and exegesists of all times that that only Allah knows their exact meanings. Their presence is not inconsistent with the character of the Our-an as a plain book." The book of nature is also a plain book, but how few can fully understand it? Every one can get out of the Our'an plain guidance for his life according to his capacity for spiritual understanding, As his capacity grows, so will his understanding grow. The whole Book is a Record for all time. It must necessarily contain meanings that only gradually unfold themselves to humanity. This is not a mystery of the same class as "mysteries" by which we are asked to believe against the dictates of reason. If we are asked to believe that one is three and three is one, we can give no intelligible meaning to the words. e asked to believe that certain initials have a meaning which will be understood in the fullness of time, we are asked to draw upon Faith, but we are not asked to do any violence to our reason. There are 29 letters in the Arabic alphabet (counting hamza and alif as two letters), and there are 29 Sürahs which have abbreviated letters prefixed to them. One of these Sūrahs (Surah Ash Shura, the 42nd surah) has two sets of abbreviated letters, but we need not count this Surah twice. If we take the half of the alphabet, omitting the fraction, we get 14, and this is the number of letters which actually occur in the Muqatta’at. Surah Al-Shura Chapter/Surah 42 has a double combination of abbreviated letters one set of two letters followed by one set of three letters. If we look very closely, we would find that the combinations of disjoined letters that run in a series in consecutive Sürahs is noticeable. For example, حم occurs in seven consecutive Surahs from 42-47. The combination الر occurs in six consecutive Surahs 10 to 15, but in one of them (Surah 12) it is modified to المر connecting it with the الم series. The الم series covers 6 Sürahs. It begins with Surah 2 (Al Baqarah) Surah 3, which are practically the beginning of the Qur'an, and ends with the four consecutive Sürahs 29 to 33. The combination طسم is prefixed to Surah 26 and 28, but the intervening Surah 27 has the combination طس, which may be considered a syncopated form, or the three-letter combination طسم may be considered an extended form of طس. Again the question arises: does the م in طسم , حم , الم stand for the same signification, or does it mean a different thing in each case? We may generalize and say that there are three series of six, and one series of three, and the other occur singly. In surah 29:27 there is a reference to the Book remaining in the family of Abraham, ans later there is a whole section, devoted to the Book, and the Qur'an (29:45-51). In surah 30:58, there is express mention of the Qur'an and the whole argument of the surah leads to the intimate relation between Allah's "Signs" in nature (30:20-27) and His revelation in the Qur'an. In surah 68, the very first verse begins with the theme with the Pen as the instrument of writing, exhorts Al Mustafa to stand forth boldly yo problem of Message and ends (68:52) with the declaration that it is a Message for all worlds. 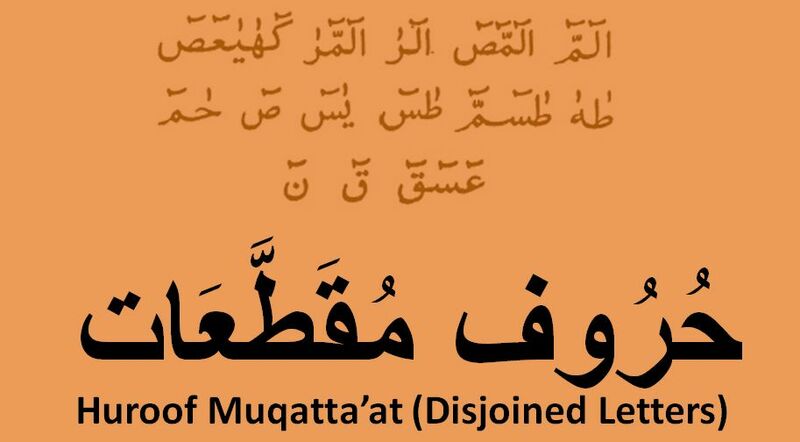 So far man has been unable to decipher these Huroof Muqatta’at - Disjoined Letters. May be someday when man attains a level of understanding that is far superior to that of now that the mystery of these letter may be solved. Reference / External Source: The main reference for this post is the Appendix I of The Holy Qur'an, English translation of the meaning and commentary, published by the Kingdom of Saudi Arabia and printed by King Fahd Holy Qur'an Printing Complex.